UGL is a trusted partner to Defence. Delivering integrated support solutions across the life-cycle of Defence assets, our capabilities combine engineering, asset management, sustainment, supply chain, facilities and base support. TR Calibration are specialists in the calibration and repair of test and measurement equipment within Australia. We also offer support and sales for a range of aviation, electrical, pressure, metrology, and industrial products. 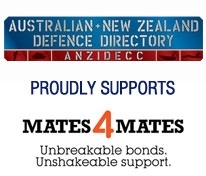 Copyright © 2019 Australian + New Zealand Defence Directory. All Rights Reserved.